First of all, the twins are doing really well. We were so surprised and grateful that they spent only two hours in the NICU before being transferred to the regular care baby nursery at the hospital. We met and held them for the first time on Wednesday, May 15, and had them back at the hotel with us the next day. Matt and Ellen introduce Julianne (left) and Henry to Matt’s siblings via FaceTime on the first day back at the hotel. 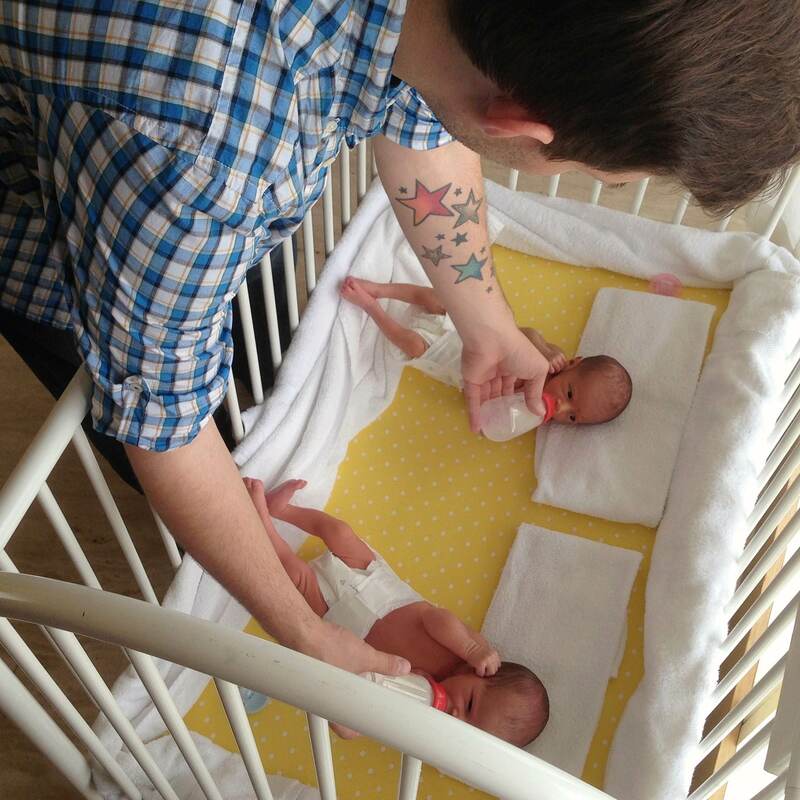 The twins have been feeding well, about every 3-4 hours (give or take 30 minutes). Henry has been eating with gusto pretty much from the beginning, and regularly puts away 60 mL of Pre-Nan formula (for babies born before 37 weeks, recommended by our hospital). Julianne started with 30 mL feedings, and is now up to 40 mL feedings. (I got her to do 50 mL once and was pretty proud. ;)) The thing with Julianne is that she gets so relaxed while eating that she falls asleep and you kind of have you keep waking her up and remind her that it’s still time to eat. I’ve learned a couple tricks: feeding her near a light source, and occasionally clearing your throat–along with the usual tricks of tapping gently on the bottle, or running a finger along her cheek–helps keep her awake. In the photo, Matt is doing a tandem feeding, which is more rare for us, but sometimes their hunger lines up in such a way that it’s handy to just go for it all at once. This has happened to us a couple times now during the 5 a.m. to 7 a.m. hours. Feeding and sleeping move in big cycles, which are relatively predictable. For example, Henry will wake up, give a few cries, and be ready to eat. I’ll feed him, burp him, change him, and get him back down. Right now that’s taking about 45 minutes from start to finish. Then it’s Julianne’s turn to do the exact same thing, usually quite soon after her brother. (The only difference is that she often gets hiccups, which requires more holding and back rubbing after the diaper change. The hiccups often go away after about five minutes of holding and back rubbing.) The feed/burp/change cycle takes about 90 minutes altogether for both of them, and that gives about 1.5-2.5 hours before repeating the cycle. The interim is good for tidying up, resetting baby supplies (formula, diapers, wipes, etc. ), and trying to get a little sleep. There’s actually a kind of pleasing rhythm to it all. The other nice thing is this: infants have very simple problems, and there are very simple solutions to them. It makes it kind of gratifying to be able to solve problems all the time and make those little babies happy. They’re also adorable. It’s hard not to just hold them all time. When I burp them and have them on my shoulder and I can hear each little breath, and feel the breaths on my neck–oh, don’t even get me started. Really, they had me at hello. So what have we been up to other than feeding, diapering, bathing, hand washing infant laundry, holding, cuddling, and burping? On Friday, May 17, Matt and Ellen went to the mall for some more baby clothes, diapers, and wipes. They also went to a pharmacy in an auto rickshaw for more of the Pre-Nan, an adventure in itself. When they got back, Matt and I took a taxi to meet with our lawyer, and it sounds like we’re on track so far with the process of getting the kids home. To (really) simplify things, there are three steps: (1) get the twins’ Indian birth certificates, (2) go to the U.S. Consulate for DNA tests that will allow the processing of American passports, and (3) get an exit visa from the FRRO so we can get on a plane and head back to NYC. Each has a bureaucratic process that boggles the mind, but we’re on track so far. (Matt has done an amazing job of being on top of that.) We’re thinking we can be on a plane home hopefully by June 4. On Saturday, May 18, Matt and I ventured out in an auto rickshaw and went to a local grocery store called Hypercity, which is actually a lot like a Super Target. We bought infant laundry supplies and snacks for the hotel room. On Sunday night, Grandma Ellen babysat while Matt and I had dinner with two guys who used the same clinic as we did and just had a baby boy at the same hospital. They’re from the U.S., but currently live in Singapore (for work). It was fun to put on a real outfit, go out, have a drink, and swap notes about our experiences. 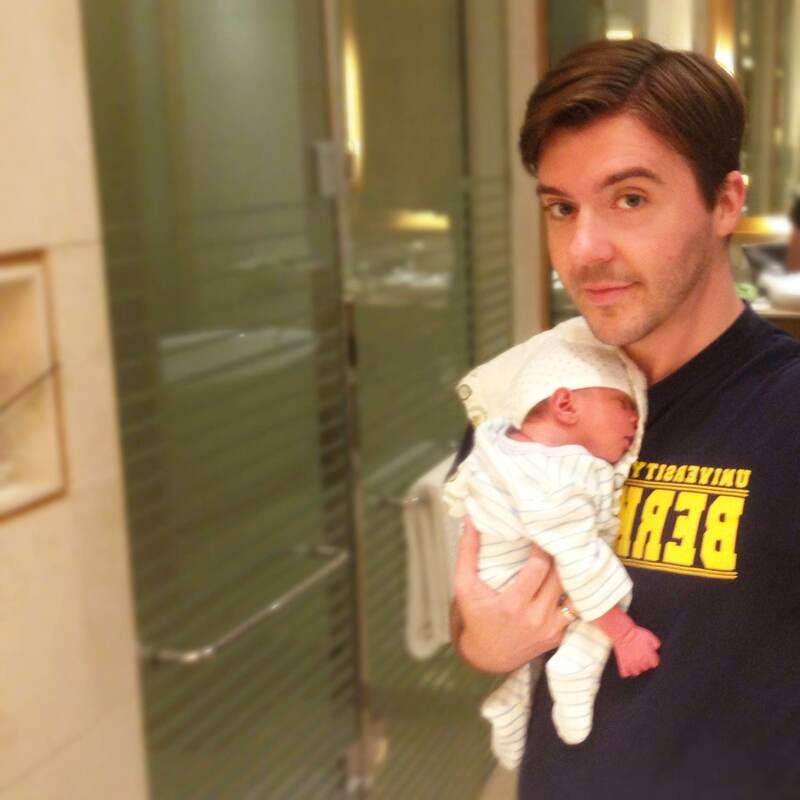 Today Matt and I returned to Hiranandani hospital for what’s called the “no dues” letter, which basically just states that we’ve paid all of our hospital bills in full. It’s a requirement for getting our exit visa from the FRRO before we can leave the country. On our way there we got in a fender bender–a car slammed into the back of ours, going about 20 miles per hour–but as soon as the cab driver assessed that there was no serious damage, he was back in the car and driving off without a word about it. So, you know, that was different. Other than that? Bottle feedings. Bottle cleanings. Diaper changes. Burping. Hand washing laundry in a bucket, and then air drying it. Getting babies to wake up; getting babies to fall asleep. Wiping bums, giving sponge baths, swiping away eye crusties. Nibbling little cheeks. Holding little warm bodies. Feed, diaper, change. Lather, rinse, repeat. 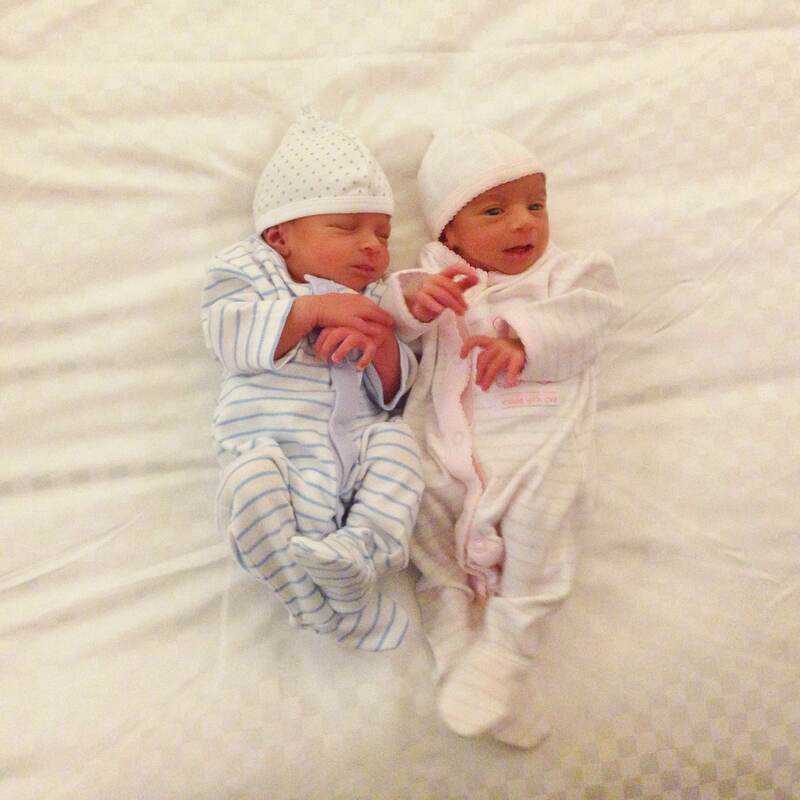 Henry (left) and Julianne, at five days old.